After the success of hybrid cars, Pakistan is about to witness hybrid rickshaws in the upcoming days. Green Wheels Private limited has recently introduced a rickshaw with hybrid specifications, in Pakistan Auto Show 2017 which was held from March 3rd to 5th 2017 at Karachi Expo Centre. According to sources, Green Wheels Private limited has already started manufacturing hybrid rickshaws. The sources also revealed lately that this new rickshaw will be equipped with a Wi-Fi and an Air-Conditioner. Just like the hybrid cars, the hybrid rickshaw wouldn’t consume fuel up to a speed of 25 km/h as the engine runs on hybrid battery up to a speed of 25 km/h. 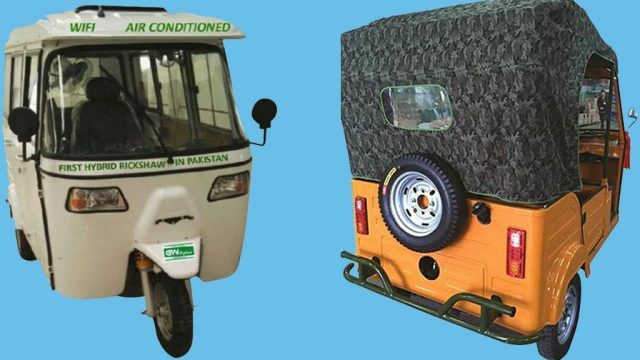 The sources also revealed that after introducing this rickshaw at Pakistan Auto Show 2017, the company is getting orders in bulk for this three-wheeler.